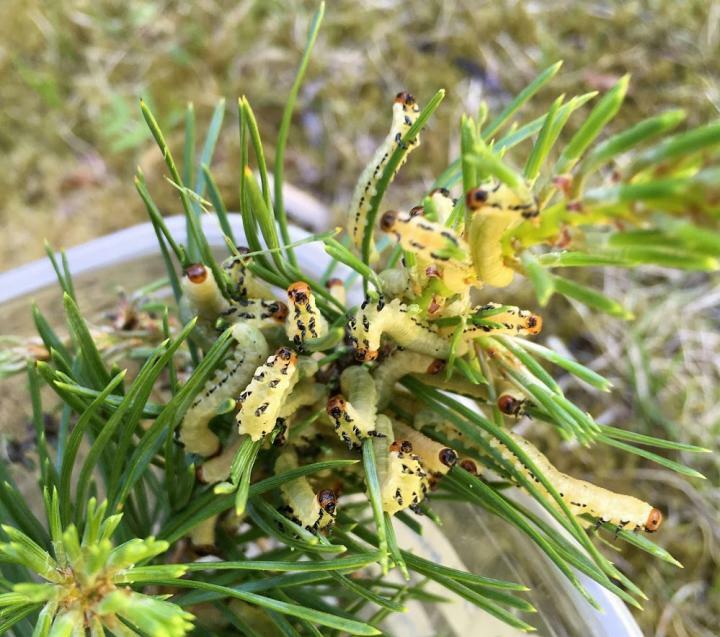 A study conducted at the University of Jyväskylä shows that ecological context affects the frequency of cooperators and freeloaders in groups of pine sawflies. Pine sawfly larvae live in groups and put up a common defence against predators. When threatened, the larvae assume a defensive posture and regurgitate a fluid that repels predators. The study shows that the larvae pay a price for this defence. Repeated participation in the common defence increases mortality of the larvae and weakens their ability to defend against predators and parasites in further encounters with them. "The research sheds light on one of the key questions in evolutionary biology about why and when organisms cooperate with other members of their species, and when they cheat them," says corresponding author Carita Lindstedt. The study illustrates that diet quality and the frequency of defence both have an impact on how costly the defence is for pine sawfly larvae. Therefore, these conditions and their interaction also determine how often larvae participate in the common defence. When larvae that were fed a diet of a certain quality defended repeatedly, they grew slower and their ability to defend against pathogens weakened. They also participated less in the common defence than larvae reared in other conditions. The study also found that males who contributed less to the common defence grew faster than those males that defended more often. Consequently, larvae benefited from not defending. Male larvae benefited more from this kind of freeloading than females did. "These results suggest that different kinds of interactions in species' habitats maintain variation in the frequency of cheating and cooperation these prey animals engage in for defence," says Lindstedt. Pine sawflies are good for studying the evolution of cooperation. In Finland they have also caused extensive damage in pine forests this year. "When we understand the ecology and social life of pine sawflies, we can better predict the conditions where they do well or do badly, and which conditions lead to rapid expansions of these pest populations. We also learn how quickly organisms can adapt to rapidly changing environmental conditions," Lindstedt says. The researchers examined the subject by measuring the defence behaviour of common pine sawfly (Diprion pini) larvae reared under different kinds of conditions. Artificial predation pressure and diet quality were manipulated in different rearing environments.